LG's 32PG6000 plasma is merely HD Ready – not Full HD – but almost everything else about it is spot on. Its 1024 x 720 resolution panel is graced by a gorgeous design; hardly frameless, as LG claims, but featuring a single pane of glass that covers the entire front of the TV. So clutter-free and quiet is the design that I'm not sure why other brands haven't followed suite. Then again, not many others put four v1.3 HDMI inputs on a 32in telly, either. Other connectivity includes RS-232C and USB 2.0 ports, the latter dealing in either MP3 or JPEG ﬁles. Despite its lack of 1080 lines, the 32PG6000 produces a ﬁnely detailed and judder-free picture from Blu-ray. Its Dual XD Engine helps create colours that are well saturated, and while it doesn't deliver the deepest blacks I've seen on a plasma, it does a better job than any existing LCD TV this size. Ditto fast-moving pictures, which look fluid and free from blur. Sound, too, is meatier than most, though its SRS TruSurround XT mode does nothing of the sort. The 32PG6000 does, however, have two significant problems. Static graphics displayed for more than a few minutes imprint onto the panel for a short period. This minor screenburn won't trouble casual users, but gamers and BBC News 24 addicts should steer clear. Its other letdown is jagged edges. Anything containing diagonal lines can suffer from a 'stepped' look, as well as a loss of resolution as the camera pans across. Freeview pictures, however, are smooth and clean. 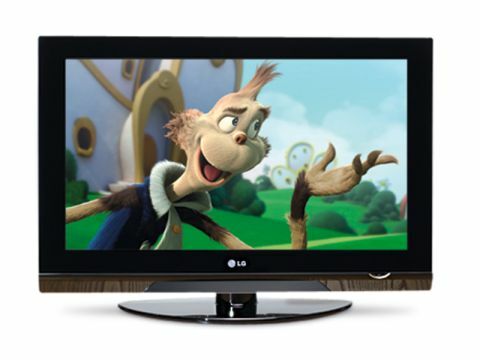 The lack of a Full HD resolution will give the LG 32PG6000 a limited appeal to purists. But it offers tremendous value, and could save many from having to sit in front of blurry TVs.